Beyond his role as Governor of the Bank of Italy, Draghi chairs the Financial Stability Board (formerly, the Financial Stability Forum) putting him in a pivotal global position, and No 1 on the FCI 500 list. 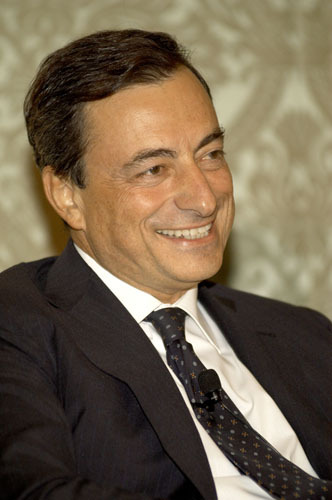 He has been mooted as a future head of the ECB when Jean-Claude Trichet's term comes to a end in 2011, and his role as FSB chairman put him in the pivotal link position between the Eurosystem and the United States' new financial stability oversight organisation that is being set up in the US Treasury under Tim Geithner. He was appointed as chairman of the Financial Stability Forum in 2006, and that organisation's 'promotion' to the role of FSB is to some degree a measure of Draghi's influence. 'The FSB welcomes the release today of the second EU-wide stress test results. The results provide additional clarity and transparency on the strength of the European banking sector and the 91 major banks that have participated in the exercise. As the FSB has highlighted in the past, regulatory stress tests are a central part of the process of improving transparency about risk exposures, supporting market functioning and facilitating the repair of bank balance sheets. The results and methodology of the EU-wide stress tests, including links to the websites of national authorities that participated in the stress test exercise, can be found on the website of the Committee of European Banking Supervisors at http://www.c-ebs.org. The FSB was established to coordinate at the international level the work of national financial authorities and international standard setting bodies and to develop and promote the implementation of effective regulatory, supervisory and other financial sector policies. It brings together national authorities responsible for financial stability in significant international financial centres, international financial institutions, sector-specific international groupings of regulators and supervisors, and committees of central bank experts. Its Secretariat is located in Basel, Switzerland, and hosted by the Bank for International Settlements. For further information on the FSB, see the FSB website, www.financialstabilityboard.org. Last year Italian Foreign Minister Franco Frattini said that Italy would be 'honoured' if Bank of Italy chief Mario Draghi were to succeed Jean-Claude Trichet as European Central Bank president. Draghi's role during the global crisis as chairman of the Financial Stability Board means he is often mentioned as a potential replacement for Trichet, but he faces a possible challenge from German ECB Governing Council member Axel Weber. Draghi is considered a monetary policy 'pragmatist' and hard to define in 'hawk-dove' terms. An effective communicator, he tries to keep a low public profile. Appointed chairman of the Financial Stability Forum in 2006, the body's profile has risen under Draghi's leadership and was expanded to the G20 countries, when it was renamed the Financial Stability Board. He left his London job as managing director and vice president of Goldman Sachs in 2005 to take over as Bank of Italy Governor from Antonio Fazio. He led a privatisation drive as director general of the Italian Treasury between 1991 and 2001and played a key role in Italy's bid to join the first wave of euro currency participants and headed the European Economic and Financial Committee which prepares the agenda for monthly Ecofin meetings. After graduating from Rome University in 1970, he did a PhD in economics at and joined the World Bank in Washington as an executive director in 1984.